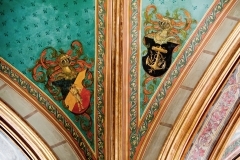 The walls are almost entirely covered by paintings depicting bucolic scenes of the lives of German nobility in the romantic framework of the 17th-18th centuries. 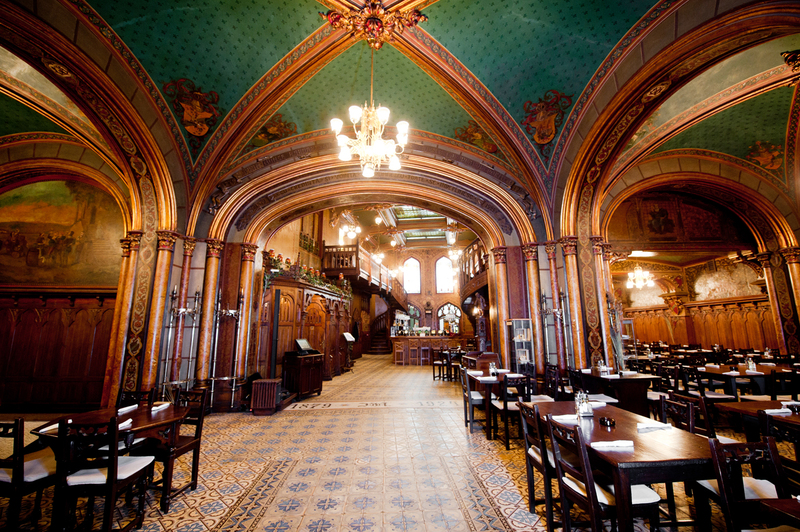 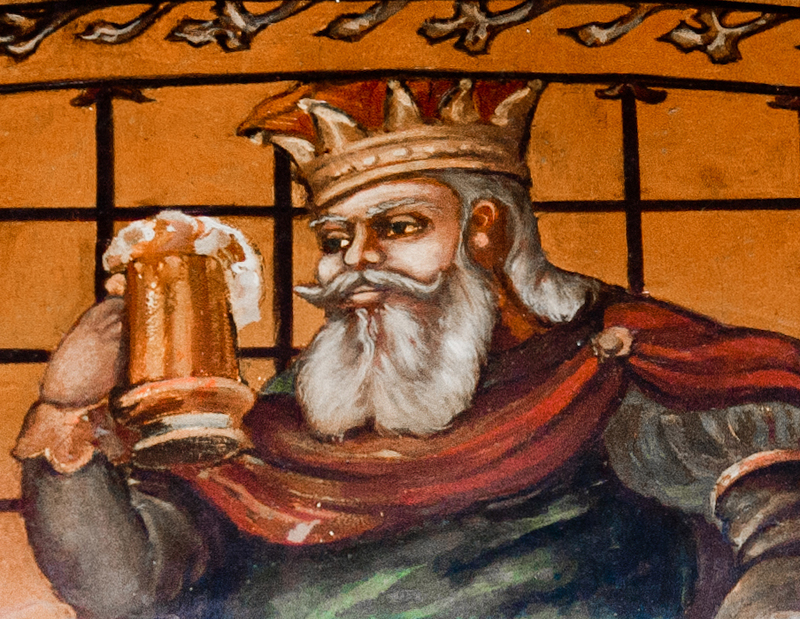 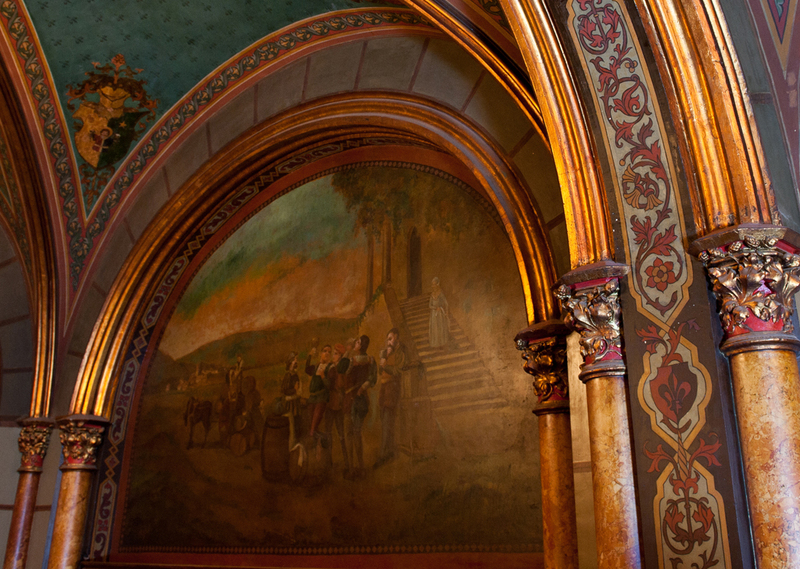 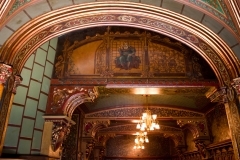 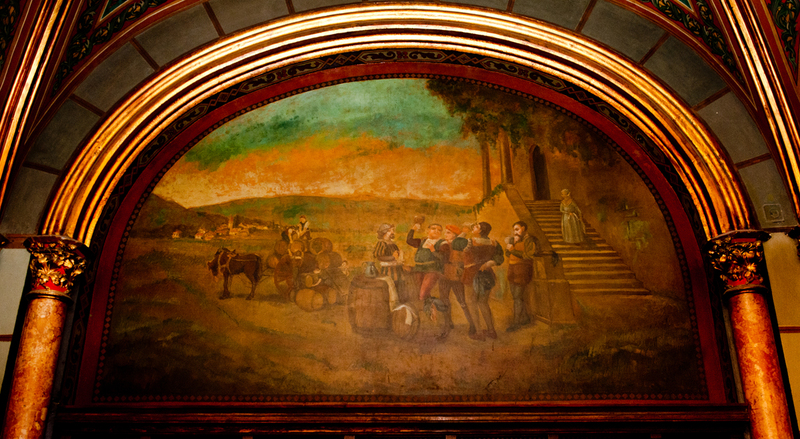 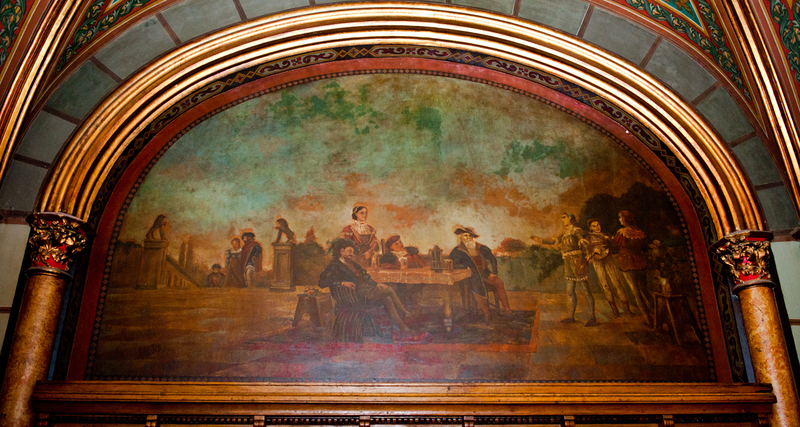 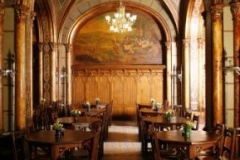 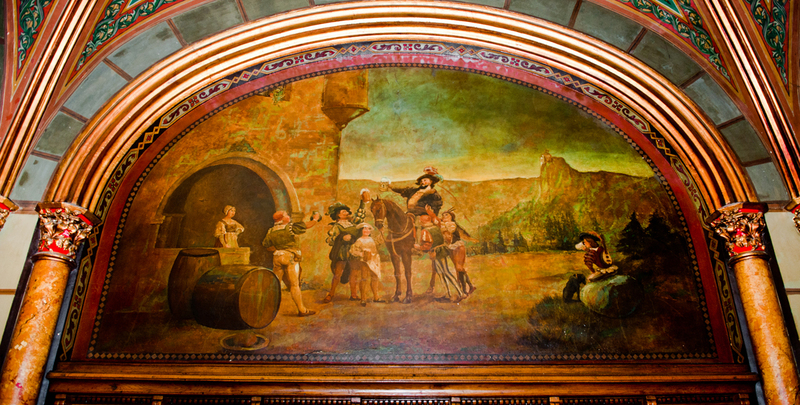 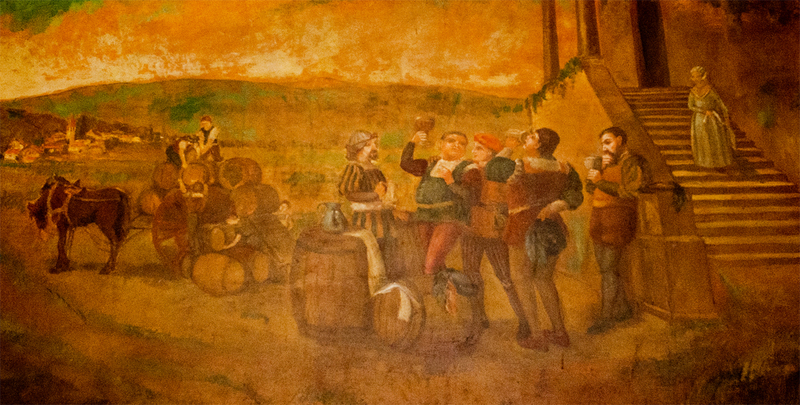 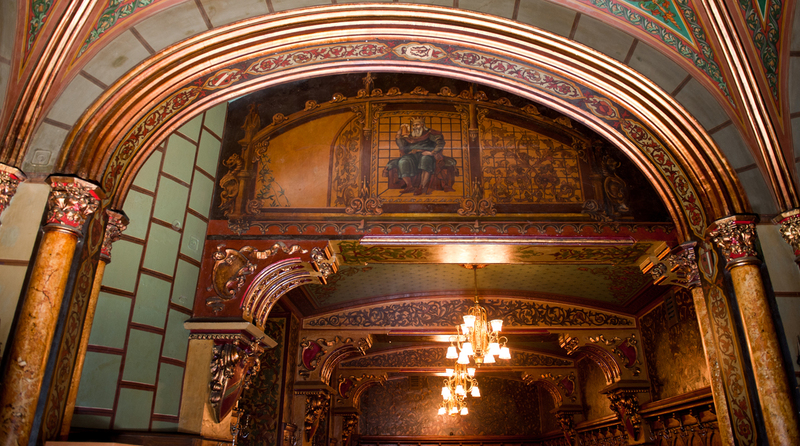 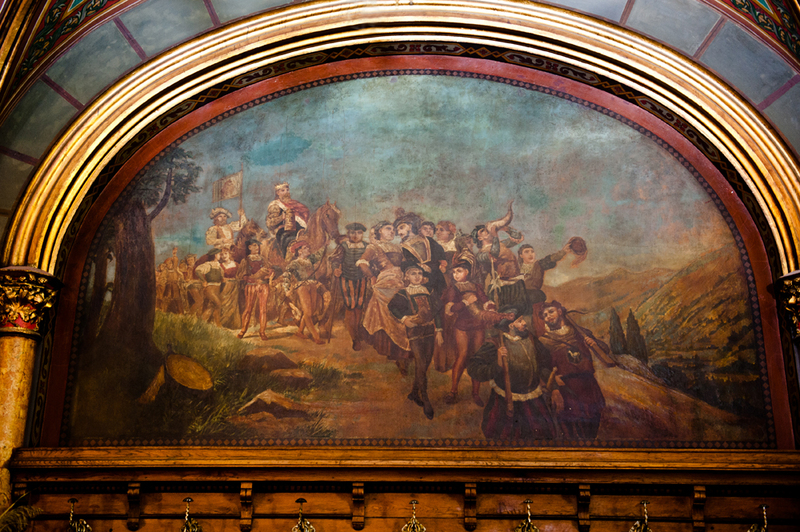 On the left wall of the beerhouse entrance, two scenes are depicted. 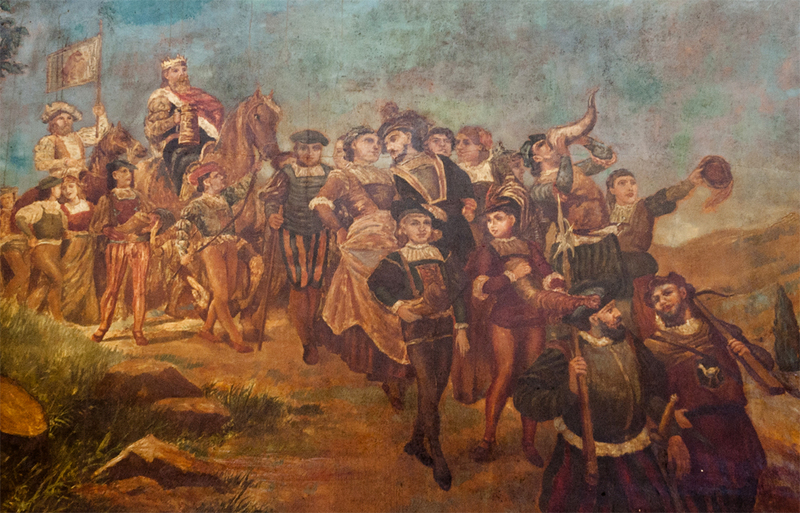 The first one, near the window, depicts a retinue of courtiers, merrily accompanying their king who rides his horse and in his right hand holds a beer mug. 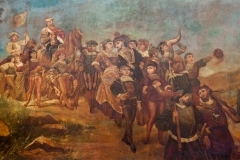 In front of the retinue, there is a halberdier and a gunsmith discussing among themselves, careless, as well as the others around, that squire behind them, holding a fur cap is showing enthusiastically the place they should reach. 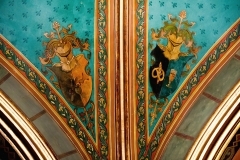 Cheerfulness and good humor animate all the characters, caught in a festive promenade. 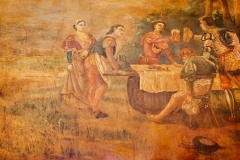 A second composition depicts a static scene. 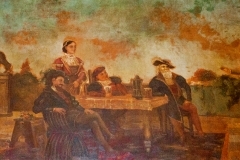 In the foreground, on a terrace, four characters (two noblemen with their wives) sit at a table with pints and listen with interest to three troubadours. 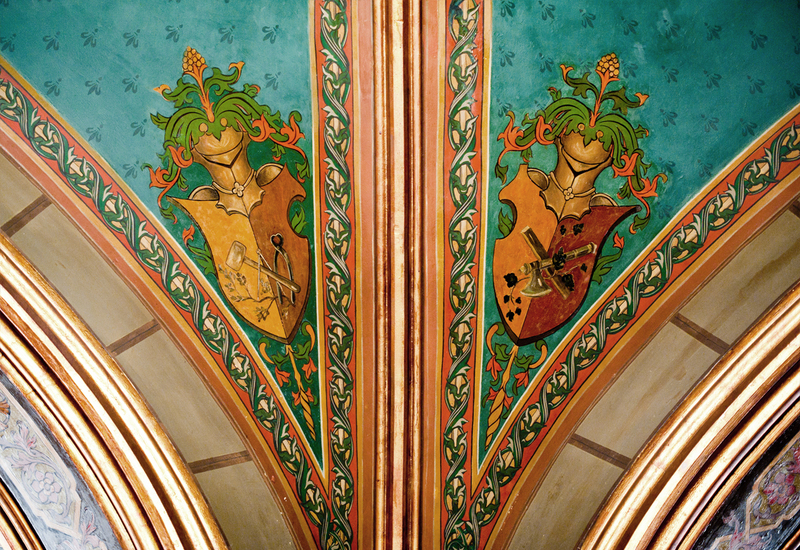 One sings and accompanies two other instrumentally. 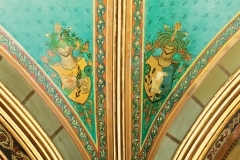 In the background, in the left of the scene, two characters solemnly climb a ladder, to reach the terrace, followed by a third at a distance. 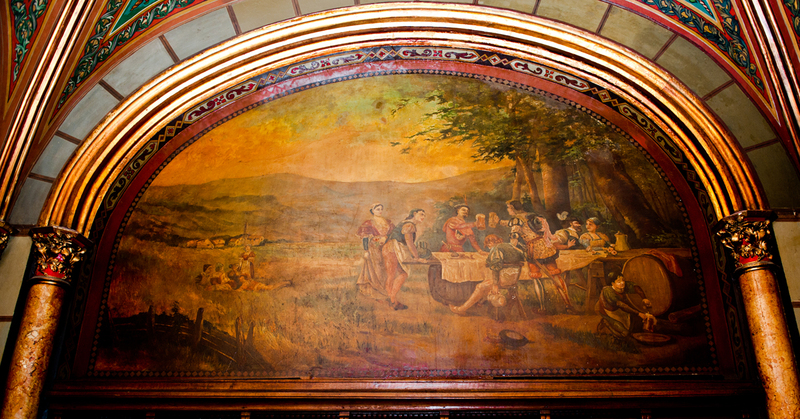 The scene would seem to suggest that personal enjoyment after a good meal is a noble delight of the soul. 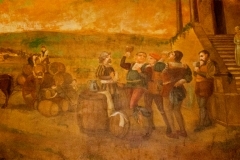 On the joined wall (above the staircase that descends to the cellar), we see a scene with a few courtiers, in the foreground, around some beer barrels just unloaded from a cart with two horses. 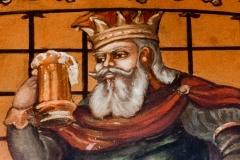 All of them taste with pleasure the sparkling liqueur, each in a different attitude, under the watchful and protective eye of the host. 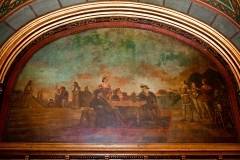 In the background, on the right, on the steps of a palace, a lady, the wife of the host, looks at the scene curiously. 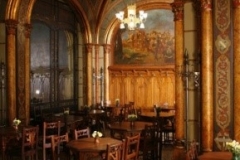 In the background there are some hills and to the left, lost in the distance, the buildings of a small town. 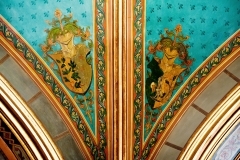 On the right wall of the entrance, two scenes are depicted. 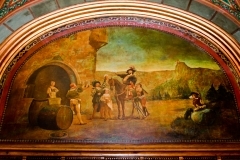 First, next to the window, depicts in the foreground, in the center, a traveler on horseback with pint in hand toasting with other knights who greeted him at the entrance to a castle, assisted by hostess. 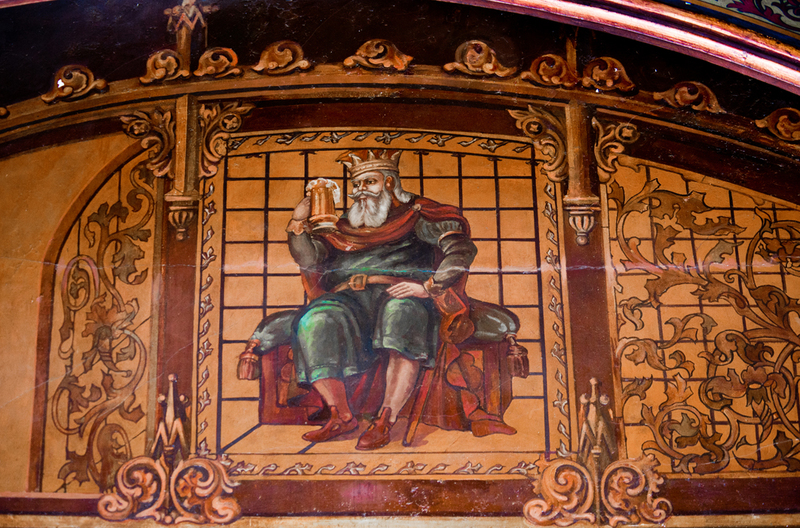 To the right of the scene, a singer sitting on a boulder, drinks from a tankard of beer, along with the dog that stands at his feet. 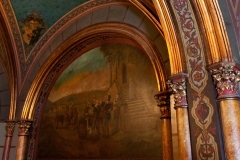 In the background looming mountains and to the left, perched on a crag, one can notice the outline of a city. 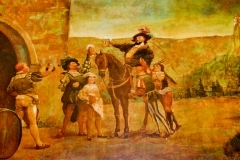 The second scene depicts in the foreground, several conducts of people eating around a table improvised in the shade of the trees, as if wanting to show that drinking can lead to interesting conversation (right pair), closer friendship (two knights toasting), and the ravages of excess beverage. 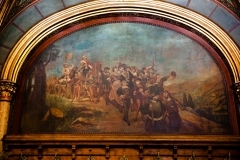 In the background, on the left, a group of young people lying down on the grass, and further looming at the foot of the mountains, the homes of an urban settlement. 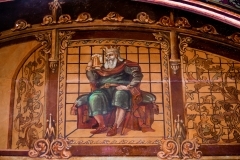 The sixth scene is located in the central space of a window between two columns and painter wished to give the illusion of a stained-glass encased in a frame of carved stone, composed as a triptych: on the front panel, a king [Gambrinus] sits comfortably on a chair and holding a mug in hand, and on the side window stylized vegetation is depicted. 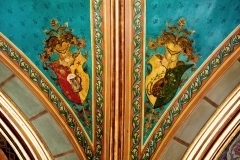 The left window is ajar, made in an exquisite trompe d’oeil. 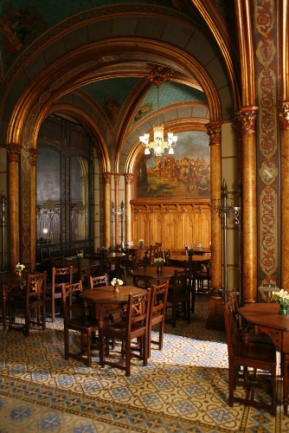 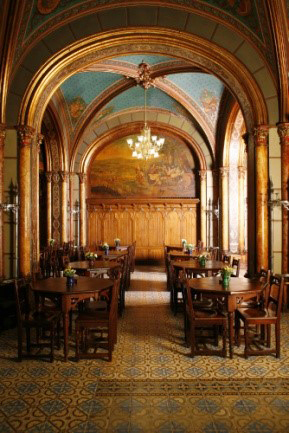 Although the paintings are inspired from similar subjects in the Munchen beerhouses of the time, they are works entitling us to admire the craft of the artist, virtuoso at depicting trompe d’oeil. 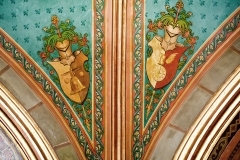 We assume the artist was of German origin. 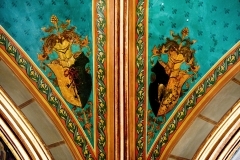 He proved to be an artist experienced in decorative paintings. 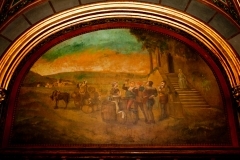 The scenes are painted in ocher and the shapes of the characters in brown shades. 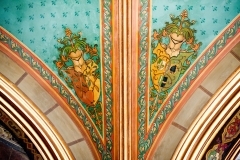 According to some sources, the frescoes and other decorations are designed by the arch. 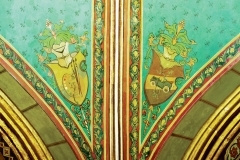 Zigfried KOFSINSKY and painted by the artists Wilhelm & Friederich HUGO. 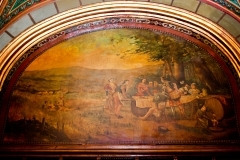 In 1924, the basement of the Stavropoleos building was transformed into a wine cellar and decorated with two frescoes depicting hunting scenes, painted by Alexandru BRĂTESCU-VOINEŞTI (1897-1995) – that were destroyed. 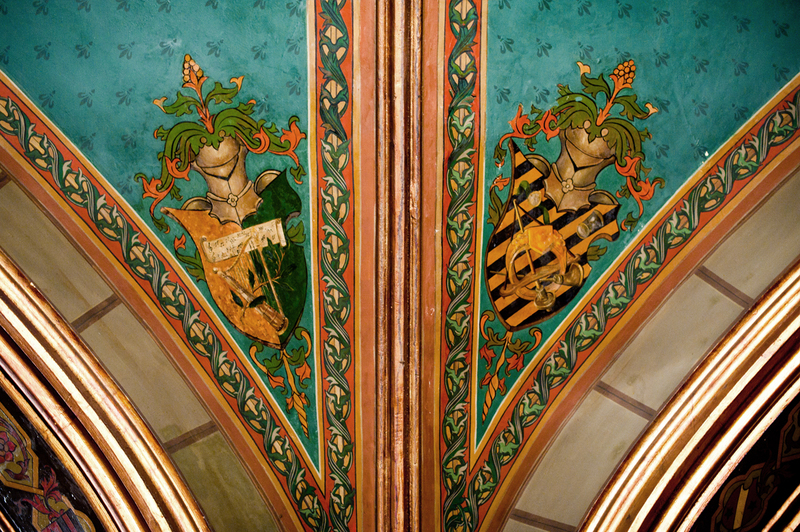 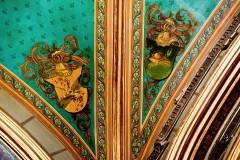 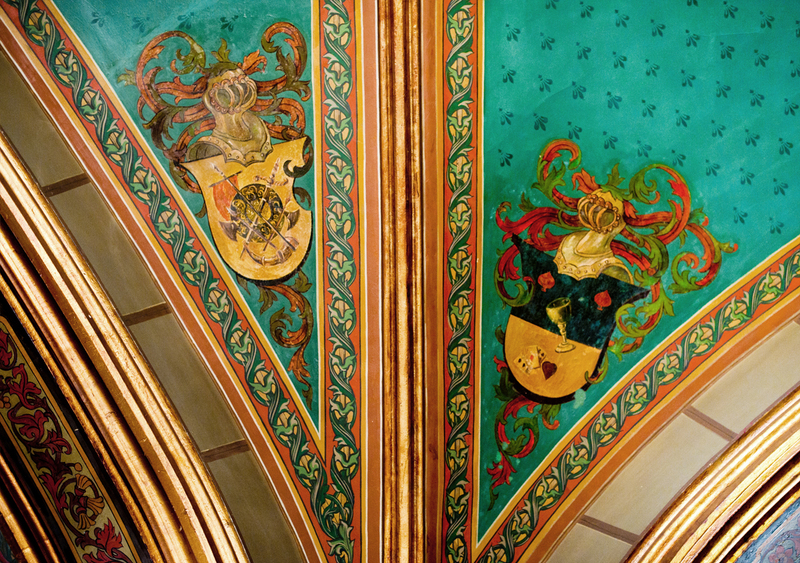 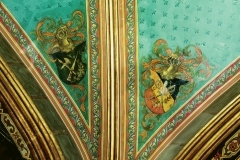 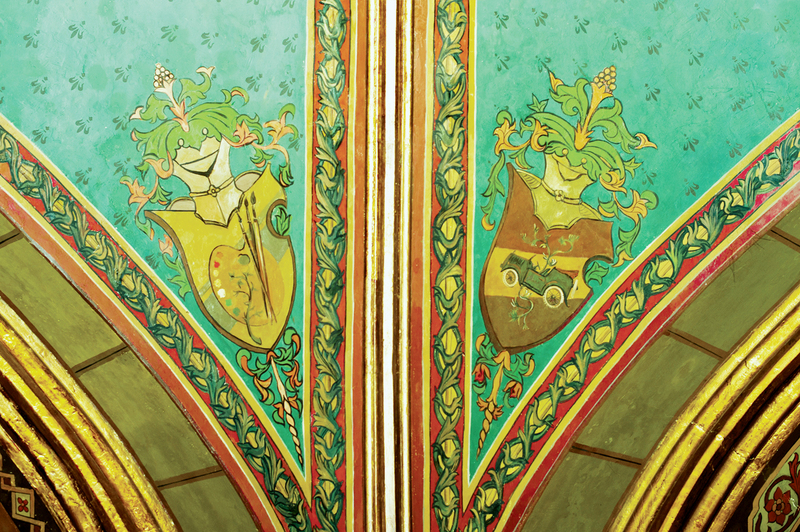 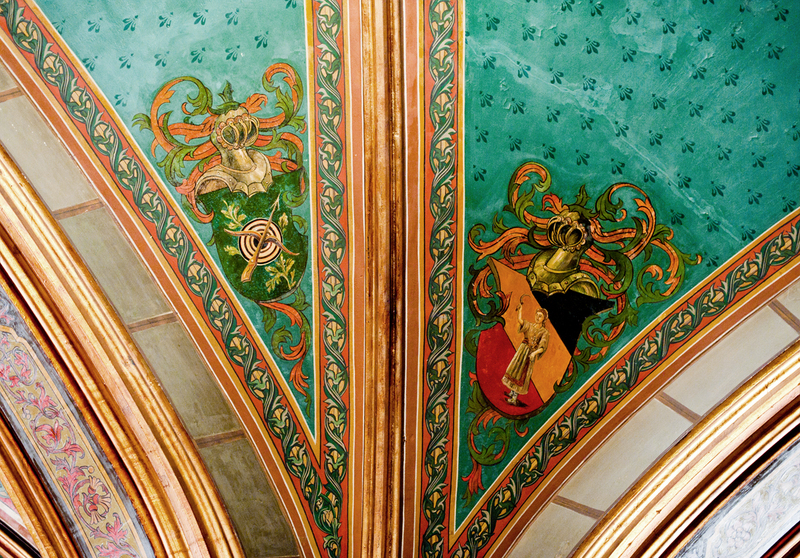 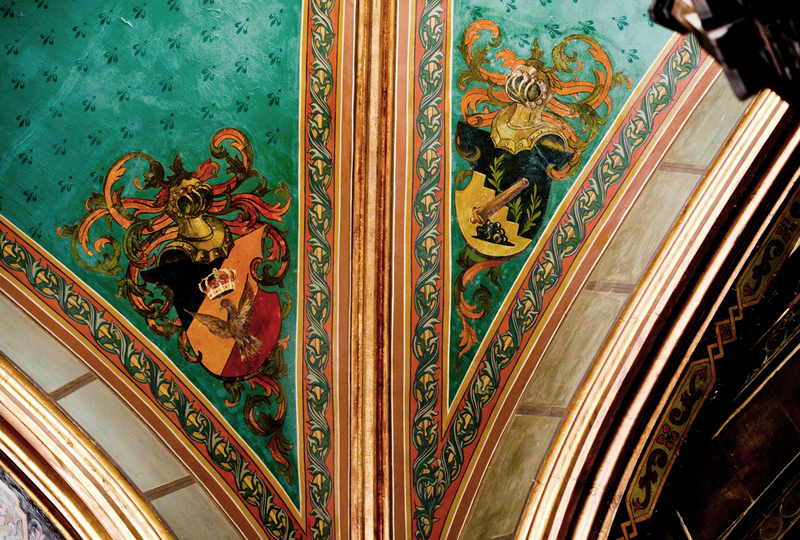 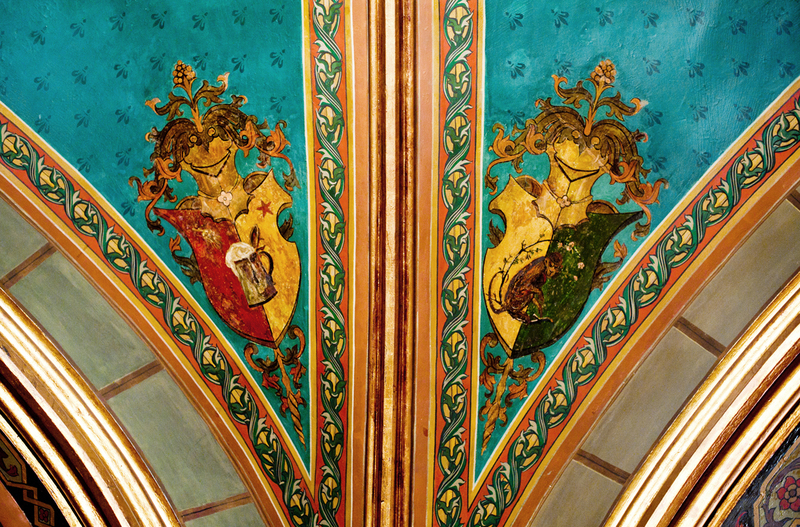 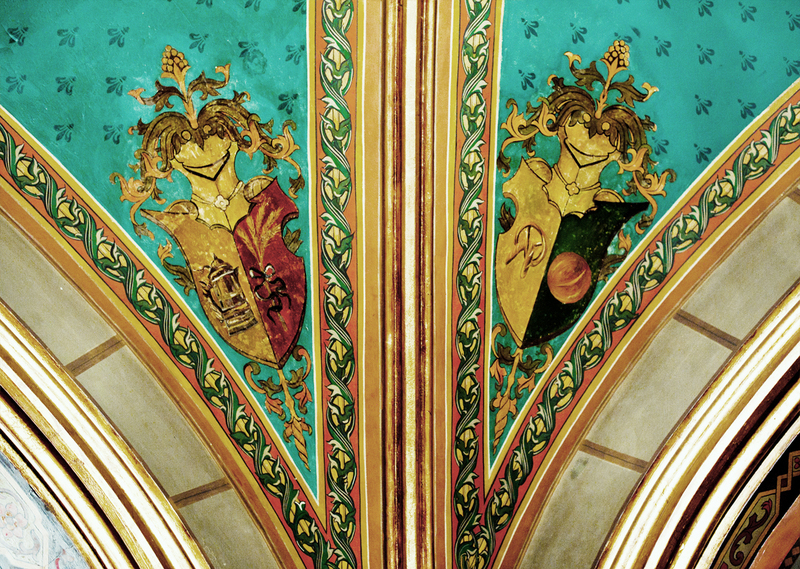 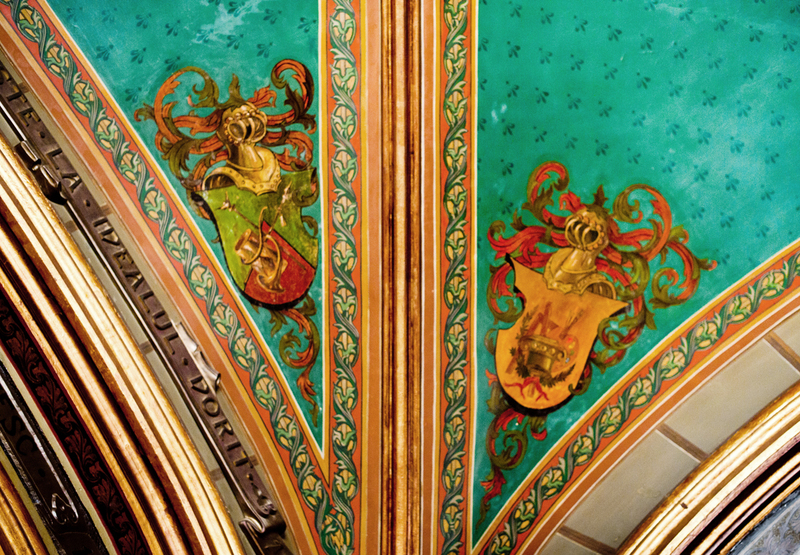 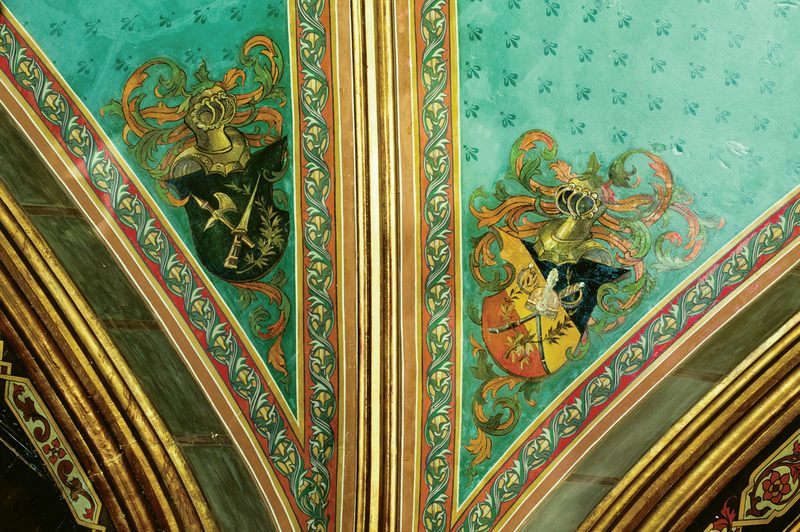 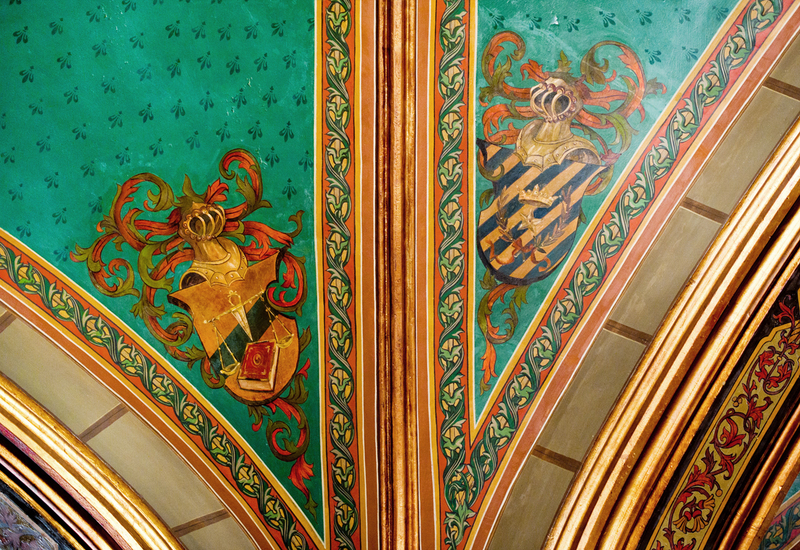 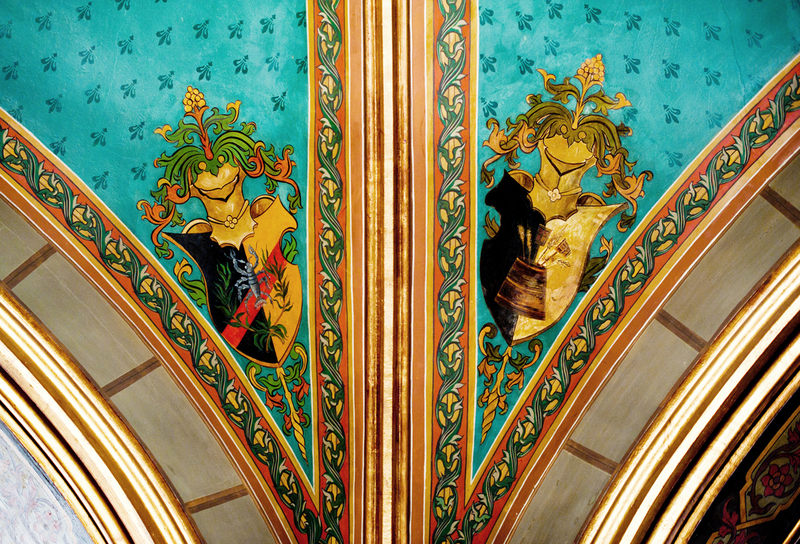 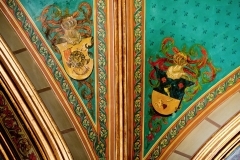 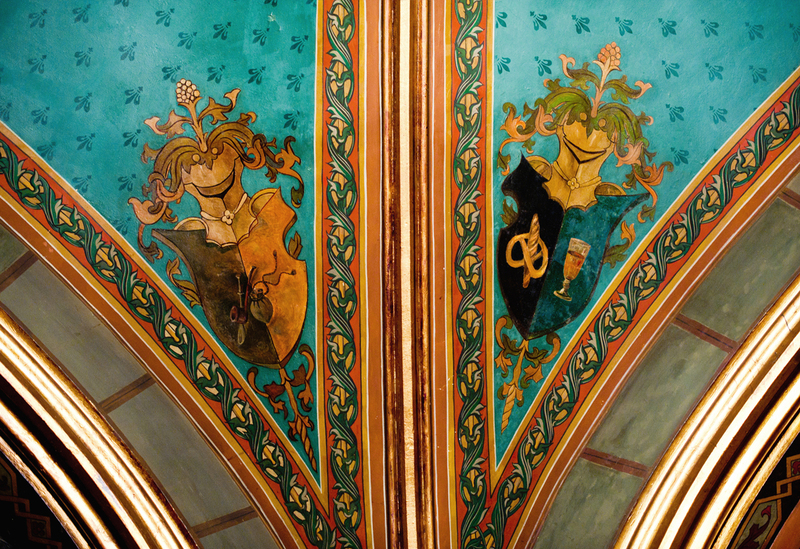 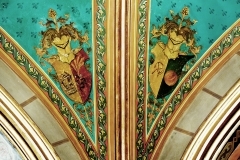 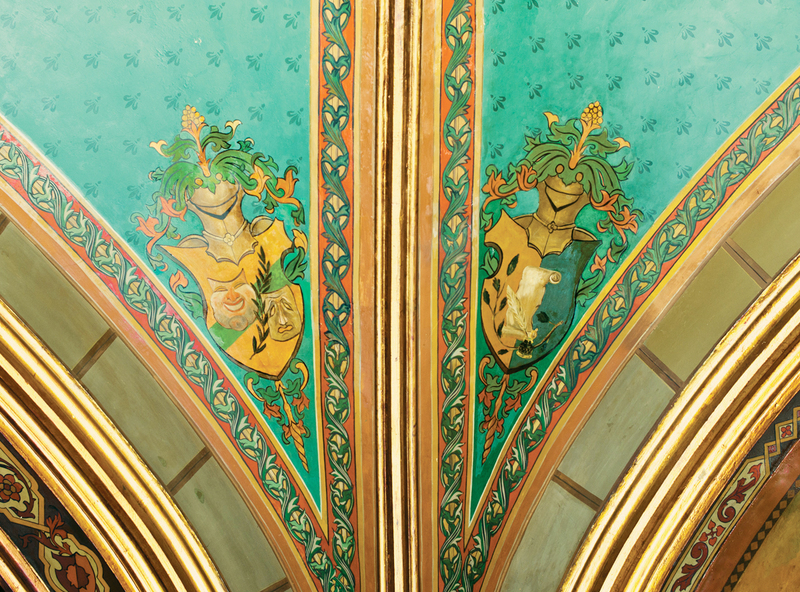 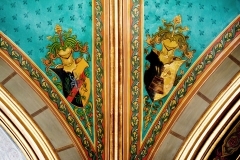 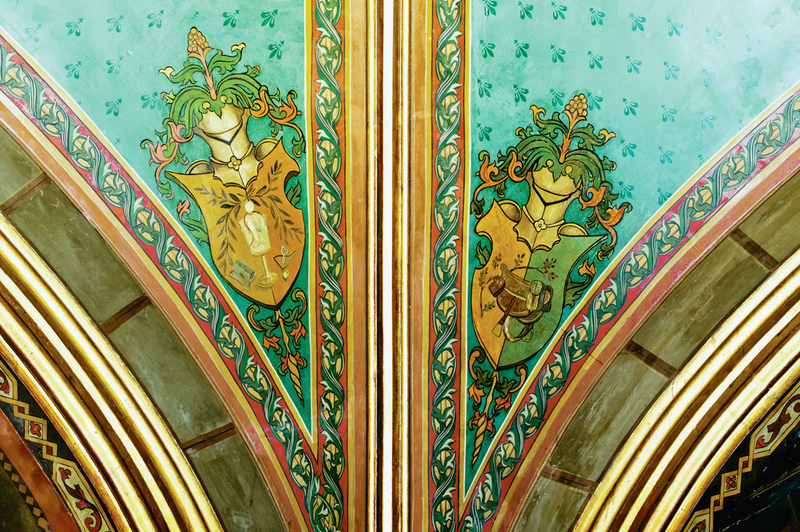 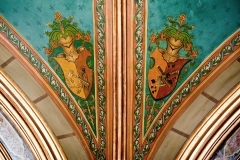 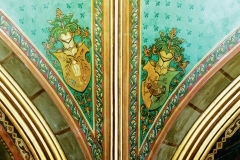 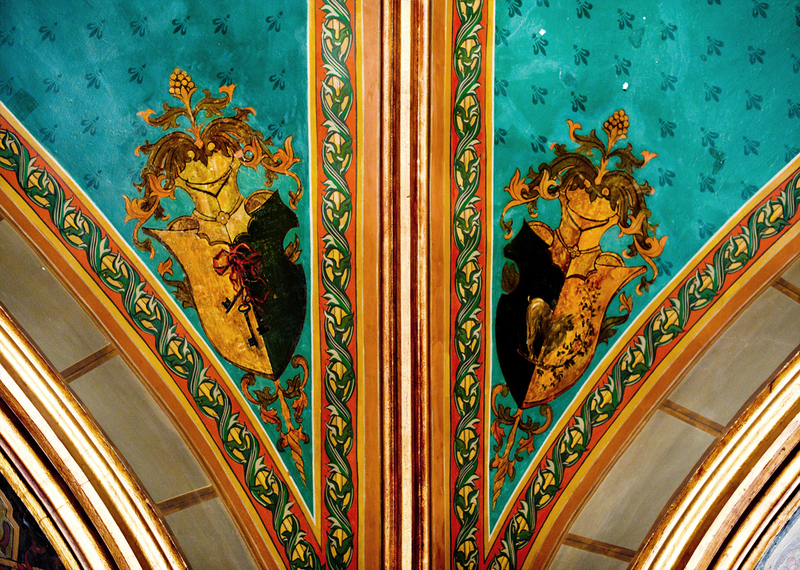 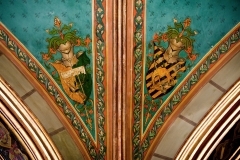 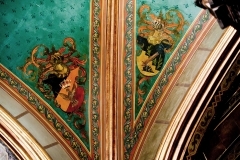 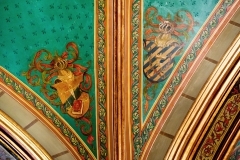 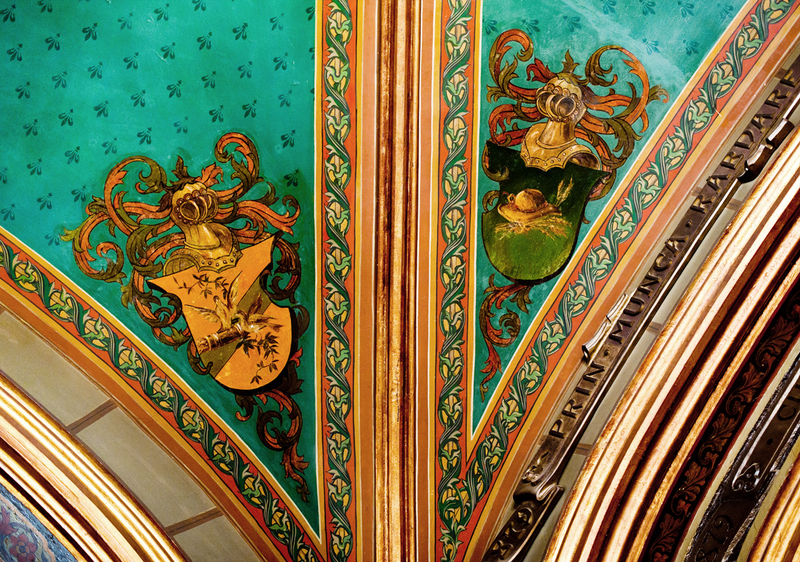 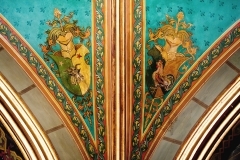 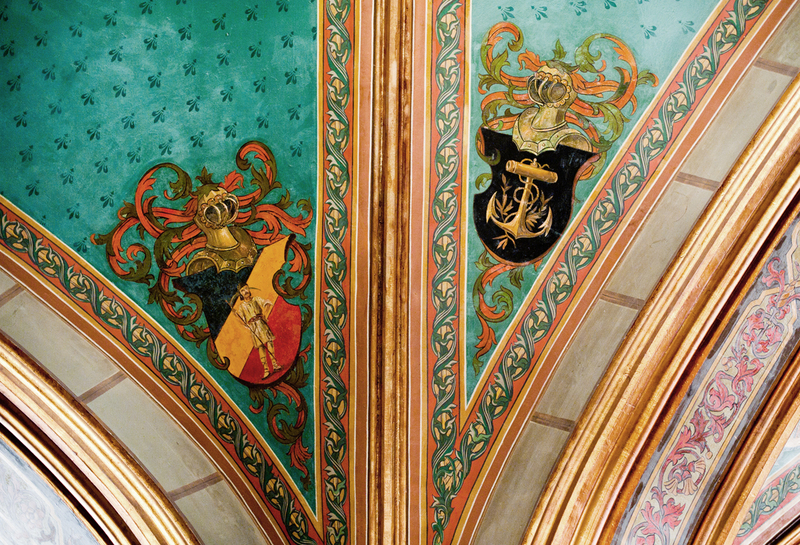 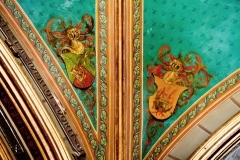 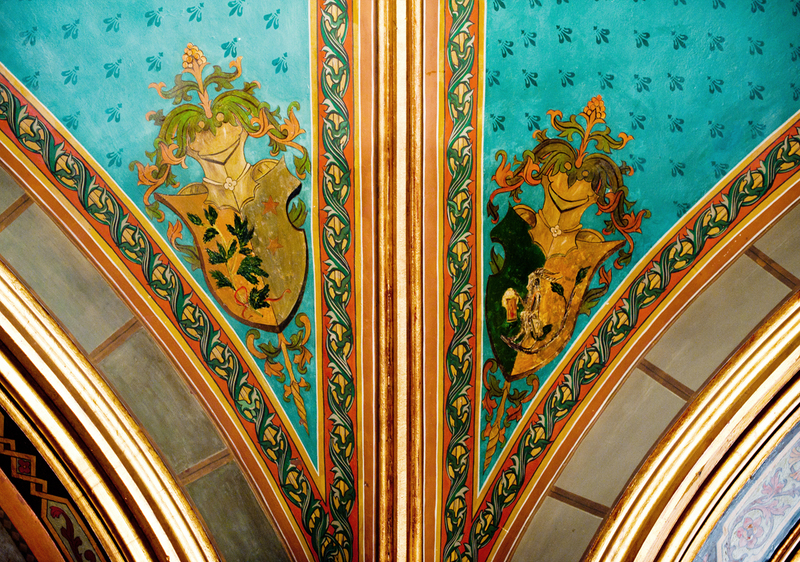 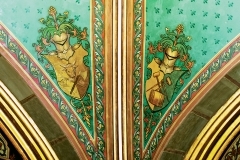 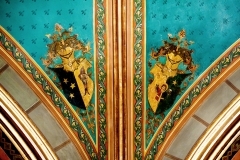 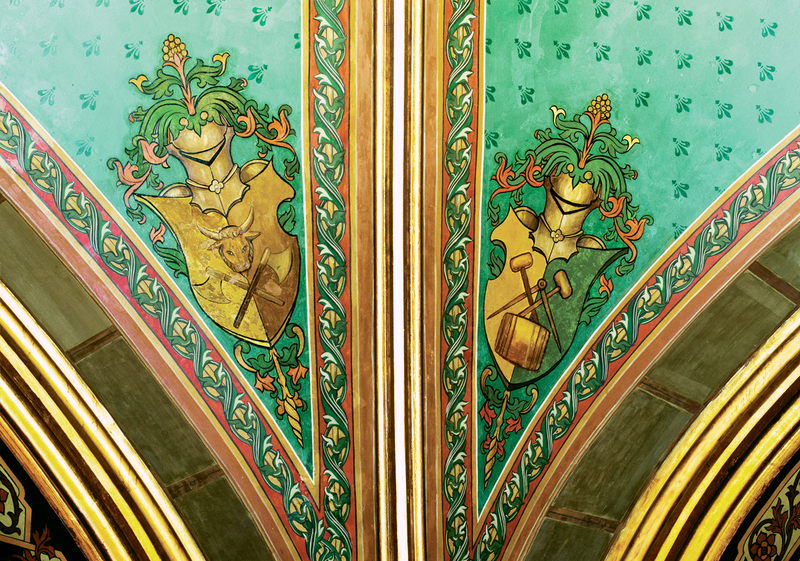 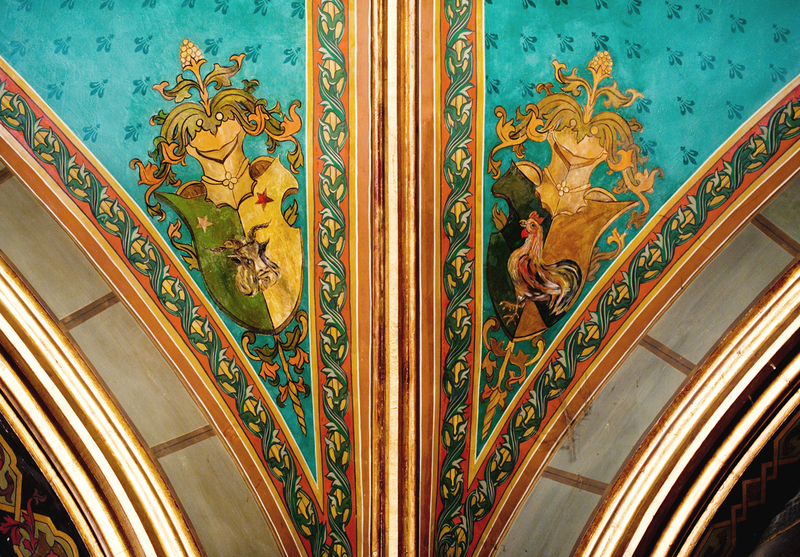 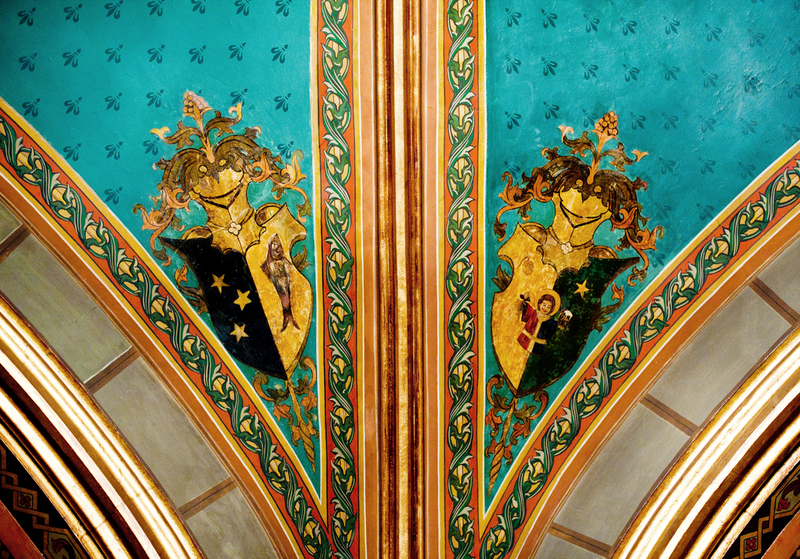 Above the columns, on the arches, heraldry of various crafts are depicted.